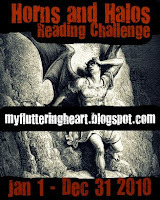 Her serious geniusness, Aimee of my fluttering heart, is hosting the Horns and Halos Reading Challenge in 2010. I’ve signed up to do seven items, but I’m fairly sure that I’m going to go overboard. Fun! Set in a society founded as an egalitarian utopia but now tainted with vices and inequity, Sharon Shinn's love story is plotty and calamitous. Rachel and Gabriel have nothing in common beyond wishing that the god Jovah had ordained they wed other people, yet they must cooperate in singing a mass to the god on the occasion of Gabriel's elevation to Archangel. Upright Gabriel has enemies among both mortal and angelic peoples who prefer to risk world destruction over his restoration of the old order. Impending apocalypse. Unhappy and dissimilar people forced into marriage. Angels in a world that blends sci-fi and fantasy. Treachery. Fate. Love? All of those things I’ve just listed would make me want to pick up the book – but throw them together, and it’s compulsively readable. I stayed up into the small hours of the morning to find out how/if it could ever work for Gabriel and Rachel, and (on a larger scale) if civilization would survive. It was worth it. But besides being the sort of book you find hard to put down, afterwards I was struck by several interesting thoughts. First off, what this story is, the romance part of it, I mean, is an arranged marriage. And if you haven’t read a Harlequin or Mills & Boon, let me just tell you: it’s been worked to death. So when I picked up the book, got about twenty pages in, and inferred ‘arranged marriage,’ I was VERY skeptical. I remained skeptical. Second: music. Sadly, I am not any kind of music aficionado. I roomed with a voice major in college, though, and now she’s marrying a barbershop singer, and they live five minutes away, so… Sorry. Got carried away. What I meant to say is that I am acquainted very peripherally with musical theory. I can identify beautiful music. I don’t make it or appreciate it as much as I should. BUT. This book can’t help but make you feel something about vocal harmonies, even though you never hear a single note. It’s as if some of the words sing. While I read the descriptions of singing, I would find myself imagining an amazing and glorious chorus. And really? That’s talent. I felt like music was being made in my heart while I read. What a precious thing! Third: names and places. Archangel is the first in the Samaria series. The god’s name is Jovah/Yovah. There are place names such as Jordana, Bethel and Mount Sinai and the Galilee River. All of these scream ‘Biblical’ to me. And really? It’s a story about angels. Archangels, even. So what does this mean? It’s symbolism, definitely. I think that the point is to realize that the world is a religious colony. I didn’t get that the first time I read a Samaria novel: I thought it was pure fantasy, an alternate world. But that’s where the ‘sci-fi’ part comes in. All of these names link the world of angels to a possible real past in ‘our’ world. Space and science have changed the histories and memories of mankind, but it could be part of the future. Very interesting to think about, at any rate. If you couldn’t tell, I liked this book a lot. Just thinking about it and typing up this review, I remembered how engrossing the story was - so I ordered Jovah’s Angel, number two in the series. I can tell there’s another sleepless night in my future! I am so excited to post my first review - but alas you beat me to it - well done! This is such a precious review - I freakin wanna read Archangel so bad now!!! Yay - a fantastic review to start of the year! I checked out my first book for this challenge yesterday. Great review - I read one book by Sharon Shinn I didn't like, a while ago, but I've been meaning to try her again. Sounds like an intersting book and series...thanks for brining them to our attention. Never heard of these books bu they do sound interesting. Thanks for the good review. interesting blog , happy new year to you :) !